The youngest Indian religion, Sikhism originated in the Punjab area of Pakistan and northwestern India in the latter part of the 15th century. In some ways, the Sikh religion can be considered an ethnic religion because the growth of Punjabi identity was closely related to the rise of Sikhism. Membership in the community and the religion go hand in hand. Its founder, Guru Nanak, was the first of ten Sikh Gurus. His writings are published in the Guru Granth Sahib, which was composed by Sikh Guru Nanak Dev, Guru Angad Dev, Guru Amar Das, Guru Ram Das, Guru Arjan Dev, and Guru Tegh Bahadur, along with several saints and historians, and serves as the main text of Sikh scripture, along with the Adi Granth, which was compiled largely by Bhai Gurdas, the Dasam Granth, containing material attributed to Guru Gobind Singh, and the Janamsakhis, which are stories believed to be biographies of Nanak. The concept of the guru is at the heart of the Sikh religion. To the Sikhs, God is the true Guru, whose divine word was made available to mankind through ten historical figures, each known as gurus. The Sikh community, as it continues the faith of the tenth guru, is itself called a guru. The sacred scriptures of the Sikhs are themselves said to be a guru, the Guru Granth Sahib. In his natural or transcendent state, God is beyond description. Because men have difficulty relating to a God who is without attributes, God manifests himself through phenomena which are known to men. When Sikhs say that God has certain characteristics, they do not mean that they have ever appeared on earth physically, only that God's grace allows sincere devotees to understand something of him through worship and meditation. The orthodox Sikh gurus are Gurus Nanak, Angad, Amar Das, Ram Das, Arjan, Har Govind, Har Rai, Har Krishan, Tegh Bahadur, and Gobind Singh. Most of these served as the guru of the Sikhs only later in their lives, each chosen for the task by his predecessor. Most significant Sikh doctrines were developed during the period of the first five gurus. Guru Arjan, the fifth guru, was killed while in Muslim custody. After his death, there was a significant increase in political strife between the Sikhs and the Muslims. Guru Gobind Singh led the Sikhs against the Islamic powers with some success. Although he was finally defeated after a twenty-year period of conflict, Guru Singh made a difference in the way that the Sikh community viewed itself. Rather than transferring his power to a human successor, as had the previous nine gurus, Guru Singh transferred his authority to the Sikh community itself in 1699, in one sense and, in 1708, to the collection of sacred scriptures in another sense. Guru Singh challenged his followers to present themselves as human sacrifices, as a test of their faithfulness. Five came forward and, rather than killing them, he dressed them in a new form of uniform and presented them to the community as the Khalsa. The males of the Khalsa become the Singhs, while the females became the Kaur. At the age of fourteen, Sikhs may be initiated into the Khalsa. Singhs carry a ritual sword, as testimony to their status as a warrior. Not all male Sikhs become Singhs. Some choose to remain Nanak-panthis, or followers of Nanak, as a display of pacifism. Over the years, a variety of sects have developed among Sikhs. Some are divided over an alternate lineage of Gurus, including some who follow a living guru. Others have a different interpretation of the Sikh scriptures or hold other concepts. The main sects of Sikhism include Akhand Kirtani Jatha, Namdharis, Nanakpanthi, Nirankari, Radhasoamis, Ramraiyas, Ravidassia, Sanatan Sikhs, Udasi, and 3HO, the latter being a Western group that was formed in 1971. The Indian state of Punjab, with a Sikh majority, has the largest scheduled caste population in India. Although publicly disavowed by Sikhism, Sikhs have long practiced a caste system, which is more pronounced in rural areas today. More than 60% of Sikhs are members of the Jat caste, which is agrarian. Other castes include Ahluwalias, Arora, Kambojs, Khatri, Kumhars, Labanas, Ramgarhias, Sainis, and two Dalit castes, the Mazhabis and the Ramdasias. Sikhism is the ninth-largest religion in the world, and one of the youngest. About 75% of Sikhs live in Punjab, while communities of Sikhs migrated to the neighboring states, such as Haryana. Sikhs account for only about 2% of the population of India, however. The Sikh diaspora includes Canada, East Africa, West Africa, the Middle East, the United Kingdom, the United States, and Australia, primarily to fill labor markets. There are small populations of Sikhs in Western Europe, Mauritius, Malaysia, Philippines, Fiji, Nepal, China, Pakistan, Afghanistan, Iraq, and Singapore. As religions go, Sikhism is a relatively new one, its founding dating from the fifteenth century. The religion was centered in northwest India, a part of the world where Hindus and Muslims had lived side by side for four centuries, always in tension and sometimes in open conflict. Sikhism drew from both religions but developed a character of its own. While Sikhism is a syncretic religion, it is not the result of a simple reworking of Hinduism and Islam. Rather, Sikhs believe that God appeared to Nanak, the founder of Sikhism, charging him with the mission of redeeming a divided world. The ground had already been prepared for Nanak by men who had seen the need for a new religion, but had concentrated their efforts on reforming Hinduism, which they believed to have become decadent. Known in India as Musulmans, the Muslims had reached India by the eighth century, and came to hold enormous power, dominating all of northwest India by the eleventh century, and had extended their reach to all of India. A Hindu sect was established in the fourteenth century, by a reformer named Rmananda, which rejected the Hindu caste system, as well as its prohibitions against eating meat. His disciple, Kabir, had even more influence on local religions. Raised by Muslims, he hated idols, and did not believe that God could live in an image of stone. He rejected many of the external forms of religion, such as the rituals, pilgrimages, and baths in the Ganges, unless they were accompanied by inward morality. Nanak was born in 1469 to Hindu parents of the mercantile caste known as Khatri, but they were low on the economic scale, his father being an accountant and farmer. He was raised in the village of Talwandi, which was governed by a Hindu who had been converted to Islam, but remained tolerant of Hindus. Growing up in an area that contained both Muslims and Hindus, Nanak was familiar with both faiths. After God assigned him the task of creating a new religion, he went about it enthusiastically, spending years touring north and west India, gathering disciples and spreading the message. When he died in 1858, at the age of sixty-nine, tradition has it that Sikhs, Hindus, and Muslims all gathered to mourn him. What was the religion that he created? What do the Sikhs believe, and how do they practice their faith? Despite the blending of two very different faiths, Sikh doctrine is not complex. It involved the adherence to one God, who Nanak referred to as the True Name. He believed that the True Name is manifest in many ways, and other many names, but that he was eternally one, the omnipotent God. Nanak incorporated the Hindu doctrine of maya, but did not give it the connotation of pure illusion, teaching instead that material objects, although they exist in reality, may build up a wall of falsehood. God, he believed, created matter as a veil about himself that only spiritual minds could penetrate. God was the true creator, not maya. Like the Sufi Muslims, Sikhism emphasizes that God dwells within the world, as well as in the human heart. In his teachings, Nanak denounced both Hindus and Muslims for practicing the forms of worship without truly thinking about God. He viewed religious rituals as a distraction from true worship. He also held that Sikhs had a social mission to perform, and one that should be extended to everyone in the community, regardless of their class, society, or religion. He criticized the Hindus for running away from the problems of the world, and the Muslims for confining themselves to the duties and rituals associated with the mosques, and for their intolerance toward non-Muslims. The creed that Nanak subscribed to was entirely peaceful and conciliatory. He believed that a good Sikh must accept others without regard to caste, to avoid arrogance or quarrelsome topics, and to be respectful of others. Upon the death of Nanak, he was succeeded by nine gurus. The first four followed, essentially, the teachings of Nanak. The fifth guru, Guru Arjan, began a transition that became more militant. Largely, this was due to changes in the attitudes of Muslim authorities. Arjan also compiled the Adi Granth, which became the Sikh Bible. In this work, he brought together the devotional hymns that were used by Sikhs in worship, along with many of his own composition, and some that had been composed by the second, third and fourth gurus. Guru Arjan was charged by the Muslim authorities with political conspiracy, and tortured to death. Before he died however, Arjan appointed his son, Har Govind, to sit on his throne, with an injunction that he maintain an army. Guru Har Govind also began carrying a sword. He refused to wear the turban and necklace that had been worn by his predecessors, viewing them as being reminiscent of pacifism. Instead, he wore a turban adorned with a royal aigrette. Guru Har Govind was arrested by the same Muslim ruler who had ordered the death of his father but, after the death of the ruler, he was released upon payment of a fine. The next three gurus continued the practice of maintaining a defensive militarism. The tenth guru, originally called Guru Govind Rai, became better known as Guru Govind Singh. While continuing the militarism of his more recent predecessors, he also composed songs, many of which had a militant theme, compiling them into the Dasam Granth, which was also known as The Granth of the Tenth Guru, and also made a supplement to the Adi Granth. Members of the Order of Singhs also vowed to rise before dawn each day and bathe in cold water, followed by meditation and prayer. They gave up the use of all stimulants, alcohol, and tobacco. They were encouraged to begin eating meat, as long as it was slain by a single stroke of a sword. Guru Govind also became a Singh, after which he became known as Guru Govind Singh. He opened the Order to men of every class, regardless of caste. Not all Sikhs became Singhs. Some remained Nanakpanthis, who practiced various degrees of pacifism and remained skeptical of the militarism of the Singhs. Guru Singh lost all four of his sons to struggles with the Muslims, two in battle and two by execution, and he was himself assassinated by a Muslim in 1708. He had provided for this event, however. After the death of his sons, he proclaimed that after his death, Sikhs were to regard the Granth as their guru, declaring that there was no need of any leadership other than the teachings of the holy book. This is the practice that has been continued by the Sikhs since that time. Following the death of their last guru, the Sikhs won many battles, and came to dominate the entire Punjab. When the British came in 1845 and 1848, they put up a fight, but Maharajah Dhulip, the last Sikh ruler, eventually surrendered in 1849. Having pledged their loyalty to Britain, at the time of the Indian Mutiny of 1857, the Singhs fought on the side of Britain. When the British left in 1947, the division into India and Pakistan was tragic for the Sikhs, as half of them found themselves in Pakistan, where violence shortly broke out between them and the Muslim majority. Many Sikhs fled Pakistan, trading the farms they had in Pakistan for much smaller homesteads in India. Even worse, they lost their holy places in Pakistan, including the birthplace of Nanak. Today, most Sikhs remain in India, where they make up roughly seventy percent of the population of Punjab, the only region where they are in the majority. Zail Singh, a Sikh, was elected president of India in 1982, serving until 1987, but the Sikhs have otherwise played a minority role politically. Some Sikhs have demanded political independence, and militant Sikhs were responsible for the assassination of Prime Minister Indira Gandhi in 1984. Interestingly, while sentencing the three assassins, the Delhi High Court stated that the crime had been motivated by "the highest and noblest impulses - loyalty to one's religion." Not all Sikhs are in favor of political independence from India, but the violence that has continued in that country has included militant Sikhs. Other Sikhs have immigrated to East Africa, the Far East, the United Kingdom, Canada, and the United States. Sikhs wear turbans, which differ considerably from the head coverings worn by Muslims, although they are often mistaken for Muslims in Western countries. Sikhs do not actively seek converts, so they have remained ethnically homogenous, although the faith does include some non-Indian adherents, mostly in New Mexico and California. Maintained by the Gateway to Sikhism Foundation, the site offers a comprehensive collection of informational articles on Sikhs and Sikhism, including the Sikh scriptures, the Sikh gurus and biographies of historical and contemporary Sikh leaders, as well as a Sikh history and timeline, an overview of Sikh philosophy, its flag and insignia. Sikh organizations and institutions, prayers, festivals, and ceremonies are included. Dedicated to Baba Nand Singh Ji Maharaj, the story of his childhood is told here, along with his long period of meditation, his teachings and philosophy, as well as Babaji Jeewani, Baba Harnam Singh Ji Maharaj, and other significant personalities in the Sikh religion. News and press releases are included, with an overview of Sikh teachings about life, death, and resurrection from the dead. Other resources include informational texts, video, and audio, quotations, e=cards, and others. With allegiance to Guru Gobind Singh Li and the Khalsa, the body of initiated Sikhs founded in 1699, an introduction is provided, along with the story of the Miracle of Gobind Prema, the establishment and purpose of the Order of the Khalsa, Amrit and Five Kakaars, the Mighty Clutches of Maya, the Creative Impulse of God, and several other stories, along with audio discourses, video, and other resources. Divided into six categories, the site offers an overview of Sikh gurus, martyrs and warriors, historical events, modern Sikh personalities, and institutes. Other resources include featured articles, an online discussion forum, and a guide to the organizational structure of the site, as to why castes were included in biographies, and information about adding relevant links to the site. A guestbook is included. The Sikh advocate organization is made up of men and women who believe in social change through the power of Sikhism, and who believe that men and women are created equal, without exception. Presented in English, French, German, Italian, Japanese, Korean, Portuguese, and Simplified Chinese, the site discusses Sikhism and equality in such topics as health, sexuality, lifecycles, anti-violence, and community. With the purpose to help people get closer to God and attain salvation, the site highlights the love that the Sikh religion has toward God, including its spiritual guidance and lifestyle, keeping a focus on the people of the religions of the world who do not know Punjab. Words in Punjab have popup meanings in English triggered by a mouseover, and citations from Guru Granth Sahib Ji can be viewed in the original form by clicking on the citation. Founded by Sri Guru Nanak Dev Ji, the first Sikh Guru, in the 16th century, Sikhism is one of the youngest faiths in the world. Its origins and history are outlined, along with the philosophy and tenets of Sikhism. The concepts of a Guru are explained, and biographical information and the writings of several of the Sikh gurus are included. Sikhism is compared to Hinduism, Islam, Christianity, and other neighboring religions. Powered by Xenforo, the online discussion forum allows for a dialogue on a full range of topics related to the Sikhs and Sikhism, including the teachings of the Sikh gurus, general topics on Sikhism, Sikh literature, youth issues, and questions and answers regarding the religion. Other topics are for those who are new to Sikhism, interfaith dialogues, Sikh book reviews, and editorials, as well as general socializing. Registration is required for participation. Presented in English, French, German, Hindi, Punjabi, and Spanish, by the Sikh Missionary Center in Phoenix, Arizona, the site offers the full text of a book entitled “Pearls of Sikhism,” which answers questions about Sikhism, God, creation, and heaven, as well as a history of Sikhism, a glossary of Sikh idioms, and informational articles on the status of women in Sikhism, as well as audio presentations. Available in formats compatible with the Apple iPhone and Android mobile devices, the site includes videos of the teachings of the ten gurus of Sikhism as well as other leading Sikhs, as well as videos of various subjects, such as the Lord Almighty, humility, Sikhs and gurus, Guru Granth Sahib, martyrdom, Japji Sahib, and others. Downloadable e-cards are also available, and links to related topics found on Youtube. Featured in this guide are the basic beliefs and practices of Sikhism, the Three Principles of Sikhism, a glossary of terms, and other important facts, as well as an overview of the rites and rituals of the Sikh religion, Sikh traditions, biographies and writings of Sikh gurus and other significant Sikhs, and a calendar of events. News related to Sikhism and Sikhs, its symbology, and other facts about the religion. 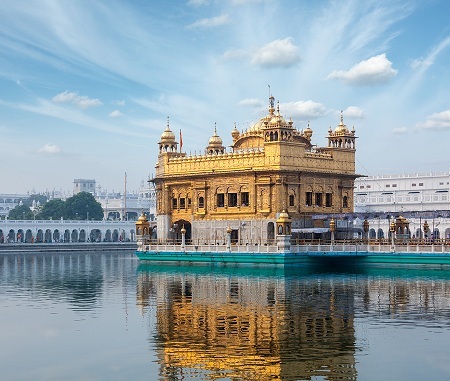 The global community for Sikhs and others interested in Sikhism provides news, educational services, and educational materials on Sikhism, including the broadcast of temple services and devotional music via online streaming. An overview of the site is offered, including its leadership structure and staffing, funding sources, and contacts. A section for children and youth are included, and a mobile app is available for downloading. This overview of Sikhs and Sikhism includes an introduction to the religious faith, as well as information on what it means to be a Sikh, the philosophy and meaning of Sikhism, Sikh beliefs and practices, the history, origins, and development of the Punjab and Sikhism. Other resources include excerpts from Sikh scripture, the role of women in Sikhism, a discussion of the Sikh way of life, and other resources. Presenting the views of Col. Nirmal Singh about the Sikhs and Sikhism, the contents of this site are organized into groups of related articles. An introduction to the author is included, and topic headings include socio-cultural matters, religion, and politics in Sikhism, Sikhism and women, justice and conflict, and the foundation of Sikh theology, as well as various cultural, educational, and historical matters. A blog is included. Founded as a volunteer organization in 2001, in response to a series of violent attacks against Sikh Americans, the coalition has become the largest Sikh American advocacy and community development organization, currently with a full-time staff. Its history and a timeline are presented, along with an overview of its work, opportunities to help, and general information about the Sikhs. A blog is included. Established in 1999, United Sikhs is a non-governmental, non-profit, humanitarian relief, human development, and advocacy organization affiliated with the United Nations. Its history and mission are highlighted, along with membership information, jobs and internship opportunities, a calendar of events, annual reports and reviews, and general information about the Sikhs. Hate crimes may be reported through the site. Based in Maryland, the organization strives to introduce the Sikhs and Sikhism to Americans, attesting that the Sikhs value freedom, equality, and justice. A general introduction to the religion is put forth, including a discussion of the values and lifestyles of the Sikh community, the origins of Sikhism in the Punjab region of India, emigration to the United States, and some of the problems that they have faced. Search for Sikhism on Google, Bing, or Yahoo!